← Why Do I Blog Meme? I’ve written several posts about the region I’ve been working on. My plot is tucked behind a mountainous wall and features a waterfall and pond with stream leading to the sea. I’ve created the latest version of my Harvest Moon Café and although still struggling with details, I’m closing in on completing the latest Yordie’s Zen Garden. Following are a couple photos I took “quite early one morning”. This is a view from out on the sea that wraps around my region. A photo from the wooded area leading to the garden and café. When I began this project I wanted to create an okiya (geisha house) and use the Harvest Moon Café to serve as the ochaya (tea house). I even built a stage into the main room to accommodate performances. One problem I’ve encountered is running out of prims. For readers who don’t know what a prim is, it’s a basic object used in Second Life to build things with; each region has a limit that cannot be exceeded. For this reason, I’ll not be able to fully realize my vision. And I believe this will be the last of my Japanese themed projects for the foreseeable future. 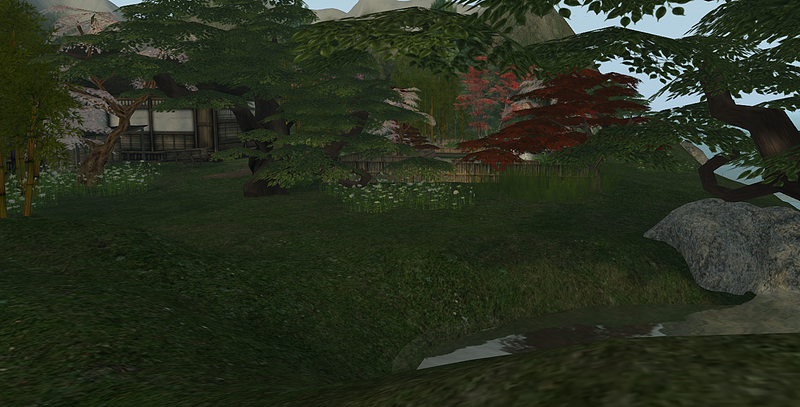 This entry was posted in Features and tagged Creating & Building, Geisha & Samurai, Photography, Second Life, Zen Gardens. Bookmark the permalink. Have you ever tried convex hull physics for building? Hi Mona… no, I don’t even know what that is. hehe. I do very little actual building anymore. I mostly modify items I purchase. I used to build when the things I wanted weren’t available, but in recent years I can’t compare my work with the work of SL’s artisans. My “art”, so to speak, is in the conceptualizing, landscaping and arranging of my gardens and cafes. Well, I hardly qualify as a competent builder myself, but there are a few things I can do and I get by just fine for now… Perhaps we can arrange a meet-up so I can show you some newer techniques that you can use to reduce land impact.